A source of live natural microorganisms used to minimize intestinal disorders, and enhance the digestion of food. 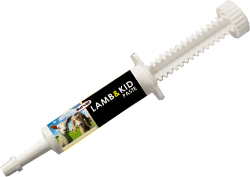 Protects lambs and kids during the critical first 24 hours. Aids in the control of scours. Gives lambs and kids an immediate energy boost at birth. Use at first sign of health problems and to supplement colostrum. Protective coating allows bacteria to be used with antibiotics.